Finished college career at No.6 on NCAA’s all-time points list following senior season that saw her surge past C. Miller, C. Holdsclaw, M. Moore, and E. Delle Donne. Surpassed career points mark for Big Ten (topping PSU’s K. Mazzante) and U of M (besting L. Whalen). Also set school’s career marks for scoring avg., FGs and FTs made, 3PFG made. 2015-16: All-America First Team (AP, espnW); Big Ten Player of Year. Also a finalist for Wooden, Wade, Drysdale nat’l POY honors; Staley Award finalist as nation’s top guard. No. 2 in nation, tops in Big Ten in scoring avg. in campaign that included an NCAA record-tying 60-pt game, and 52- and 48-pt games. Scored 20+ points 82 times (56.9 percent of her games). Tied NCAA women’s single-game mark of 60 pts (at Northwestern); tallied 52 at Mich. St., and 48 vs. UW-Milw (topping Williams Arena mark of 45 by Mich. State’s Scott Skiles in 1986). The 60-pt. game was the second in Big Ten history by a male or female (61, Rick Mount, Purdue, 1970). Broke own U of M record for 3PFGM in a season. 2014-15: Coming off back-to-back seasons in which she earned All-America Hon. 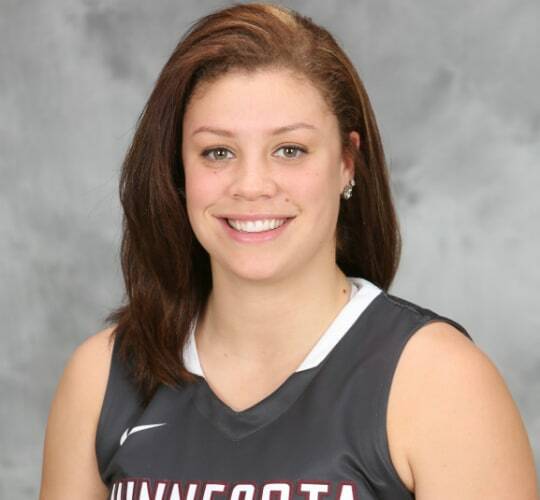 Mention acclaim (AP, WBCA) and All-Big Ten First Team acclaim, received a medical hardship waiver to return for 2015-16 after suffering a season-ending ACL injury in Gophers’ 10th game. PREP: 2011 Minnesota Gatorade POY. MISC: Has deep U of M ties — grandfather was member of UMPD for 30+ years; older brother, Cole, who was a Gophers’ RB.